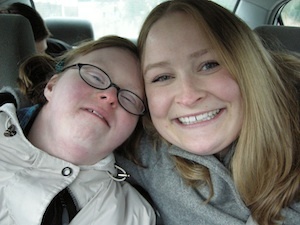 After watching her younger sister struggle to get the medical care she needed because of Down syndrome, Mayo medical student Julie Rogers knew what she wanted to be when she grew up: A doctor who helps to change things for patients with disabilities. Even though still in medical school, she's well on her way to achieving that goal. As the Rochester Post-Bulletin reports, Rogers helped to initiate a change in the Mayo Medical School curriculum to include training dedicated to treating patients with intellectual disabilities -- an accomplishment that landed her a Luther Granquist Systems Change Award from The Arc Minnesota. "My little sister has Down syndrome, and I have seen her and her friends experience difficulties receiving health care," Rogers says. "Part of the problem … is that the vast majority of medical school students are not getting any clinical training relevant to treating individuals with intellectual disabilities." Rogers shared her concerns with Mayo's Drs. Joseph Grande, Rachel Havyer, Chris Hook, Bruce Horazdovsky and Myra Wick, and as a result, Mayo Medical School has made a number of changes to its curriculum. For example, a course on genetics now includes, according to the Post-Bulletin, "interactions with individuals with disabilities and their family members." Another course on public health now includes "discussions on disability history and rights, and tips on effective interactions with a person who has a disability." Rogers tells us she didn't have to do much convincing. "Everyone was on board right away," she says. "There is a clear problem and solution, and the faculty at Mayo Medical School work very hard to ensure that we have an incredible curriculum." What advice does Rogers have for her fellow medical students, most of whom will work with people with intellectual disabilities in some capacity? It all starts with respect. "Focus on the person, not the disability," she says. She also suggests trying to form a partnership with disabled patients in their care. "They know their disability best," she says. "Ask them what you need to know." There may be times, she says, when changes in protocol need to be made to best care for patients with disabilities. Rogers says that's not only "okay," but mandatory. "It's required under the Americans with Disabilities Act that people with disabilities receive the same level of health care as other citizens," she says. Finally, and perhaps above all, Rogers says it's important to not let preconceived societal assumptions about what it means to be disabled get in the way of caring for patients with disabilities. "In health care, we tend to see disability much more negatively than people with disabilities and their families do," she says. "Disability is not a medical diagnosis, but a complex interplay between medical and social circumstance." There's more from our interview with Rogers (including what it meant to her to have her sister cheer her on when she received the award). And you can read the full interview here. And be sure to leave a comment or two before you go.